There’s always the one person in the wedding who obsesses over the small details of the wedding. It’s usually the bride or groom, and occasionally it’s one of the couple’s parents. But once in a blue moon, it’s one of the bridesmaids. She’s the one hurrying things along, checking for spots on everyone’s dresses and texting everyone to hurry up because the bouquet toss is happening right now. This person is the OCD Bridesmaid. This just refers to her proclivity to sweat the small stuff and ask questions about stuff way farther in advance than anyone ever. She probably doesn’t have real Obsessive Compulsive Disorder. People just think she does because she asks questions about how everything will go. 1.Someone has to be the voice of reason. The common advice for bridesmaids (and honestly, grooms) is to just do whatever the bride tells them to do. But the OCD Bridesmaid is often the last line of defense for the more ridiculous wedding details. She’s the one asking if there’s going to be a modern toilet in the remote cabin where the wedding’s taking place. She’s the one asking if that antique wedding dress is going to be dyed white again before the big day… because it sure looks yellow to her. 2. The photographer/couple’s parents/caterers/everyone else will thank you. In the moment, people are going to be super annoyed when the OCD Bridesmaid texts them five times to come downstairs so they can start taking photographs. Ditto if she’s constantly checking their suits for lint or assigning people to hold up the dress when the bride has to use the toilet. Yes, that’s totally a job at a wedding. It’s annoying to have someone nagging in your ear about small details, particularly if you’re all supposed to be celebrating. But when the photographs only take 30 minutes because everyone’s on time, the ushers get their tux rental deposits back and the bride doesn’t rip her bustle on the way to the toilet, the value of that nagging will make itself known. 3. No one wants to talk about details. But you need to. No one likes talking about appetizers. Or what color ties the ushers should have to match the bridesmaids. Or what type of chairs the reception hall will provide. Unfortunately, these details need to be discussed in order for a wedding to be successful. Having an OCD Bridesmaid is often a boon to a bride, because she’ll remember to ask about things the bride may not have thought of. She has the unique perspective of someone who is tied to the wedding party yet experiences it mostly as a guest. If she is given space to ask questions about the wedding (or better yet, to be given an active job in the planning of it), those things will be brought up early enough that no one will stress about them later on. 4. Every stress-saving action helps everyone. At one point, I made a flowchart of where we bridesmaids would need to be at every stage of the big day. Little obsessive? Absolutely. It probably made me look crazy to everyone else. But when people had questions about when we were supposed to show up a week before the wedding, I just pointed at the chart. It became a resource for all to use. One person’s neurotic action is another person’s headache cure. 5. Everything the OCD Bridesmaid does is one less task for the bride. Which, you know, is kind of the whole point of being a bridesmaid. 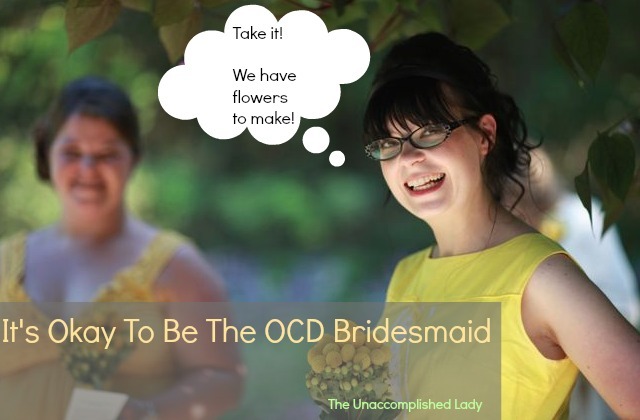 Were you the OCD Bridesmaid (or OCD Usher) in your wedding party? If not, who sweated the small stuff? Tell us your experience in the comments!